Return of one of the best knives we have seen! From way back in the 1990’s, we have been selling the Goddard designed Spydercos and our customers have always loved them. Spyderco stopped producing them some time ago and they have been sorely missed. If you’re one of the legions of Spyderco fanatics, you probably know their numbering system well enough to know that a model 18 is a pretty early design. Sal Glesser got together with Wayne Goddard in the early 90’s to produce two sizes of lightweight lockbacks with black Micarta handles. 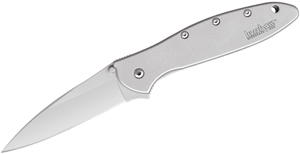 Happily, as a part of their “Sprint Run” series, Spyderco has re-introduced the Goddard Jr, for a limited run in white Micarta. This is a fabulous using knife, particularly this version with VG10 steel. In the 1980’s Spyderco entered a collaborating arrangement on a several knife designs with then, up-and-coming custom knifemaker, Wayne Goddard of Eugene, Oregon. Wayne’s custom knives were folding models and fixed blades with his signature: a drop point blade, shaped with a deep cutting belly for outdoor and everyday use. Everyone wanted them, for their high-performance steel and drop point blade shape. Today, he’s a Master Bladesmith, and cornerstone member of the American Bladesmith’s Society, who has authored several books on the art of knifemaking and steels and is a contributing editor for a knife magazine. 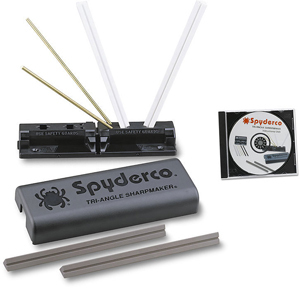 When the opportunity to collaborate again arose in 2008, Spyderco was on it. The SP18PSWH has Wayne’s traditional drop-point blade but comes paired with a white Micarta handle. 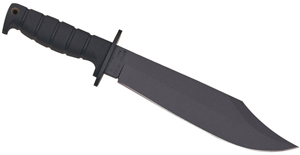 The blade is hollow-ground VG-10 steel available in a CombinationEdge. The handle is shaped so you can securely grip while preventing the fingers from sliding forward or backward.